What if I suggested putting Flash into your backup target? This is exactly what Nimble Storage has done with the recent release of their Secondary Flash array. Adding a flash tier can offer some great additional advantages to certain Veeam features and functionality when it comes to backup, but mainly recovery. Veeam works hard to reduce backup windows and any performance impact on production workloads, while keeping the system completely simple and useable. This is where the Nimble Secondary Flash array can play a big part in helping speed up those backups, the ability to leverage this data for virtual labs and the ability to run multiple Instant VM Recovery functions at once. Let’s look at the configuration for this new SAN backup appliance from Nimble. What are the key features and capabilities that this helps in a Veeam environment? Instant VM Recovery: Instant VM Recovery is the ability to take any virtualized application on VMware vSphere or Microsoft Hyper-V directly from a backup. Instead of making users wait while you provision storage, extract the backup and copy it to production, you can simply start a VM with Veeam’s patented vPower technology. After that, use VMware Storage vMotion, Hyper-V Storage Migration or Veeam’s proprietary Quick Migration to move the VM back to production storage. SureBackup / SureReplica: SureBackup provides a fully automated process that allows you to verify the recoverability of a backup. Automatically start your VM(s) from the backup repository, directly from the compressed and deduped backup file, then it will check the heartbeat, run your custom scripts, and send a report. Everything is happening automatically, in an isolated virtual network environment. You can verify VM replicas with the SureBackup job known as SureReplica. Given the additional performance of the new Nimble Secondary Flash array, the time to perform this automated verification will be much faster. 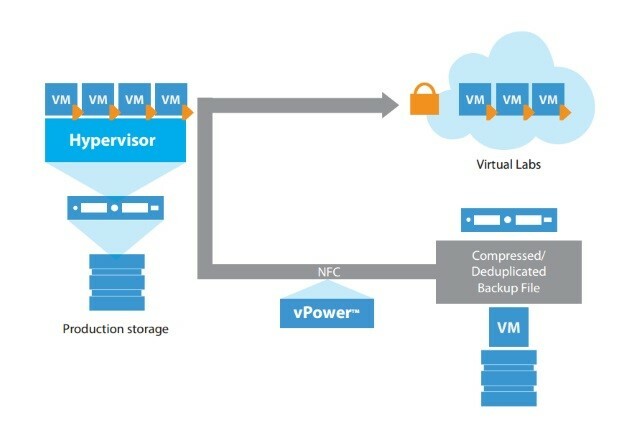 Virtual Lab: The Virtual Lab feature within Veeam Backup & Replication allows businesses to leverage the investment made on the appliance storage to spin up isolated virtual environments that can be used to automate the verification of those backup files (SureBackup), but also giving the ability to run test and development VM workloads in an isolated network. The Virtual Lab does not require that you provision extra resources for it. You can deploy the Virtual Lab on any host in your virtual environment. This flash-enabled architecture is not just going to give those recovery benefits, but also improve backup windows and bring data efficiencies with Inline Deduplication. Those aren’t things you normally hear in the same sentence — backup performance and capacity optimized storage. Per-VM backup file chains: By default, backup jobs write VM data to the backup repository in one write stream. Depending on the repository storage type, this may not lead to the most efficient and fastest way of getting that data to the backup target. Per-VM file chains allow for each VM to have its own chain. When writing per-VM to the repository, it means that there are multiple write streams. The Nimble Secondary Flash array can achieve much better performance from this configuration with multiple write streams and increase the write queue depth. Align and Decompress: The Nimble Secondary Flash array uses a fixed block size for deduplication, Veeam aligns the VM data backup to a 4kb block size boundary. This allows for better deduplication on the array across all backup files. 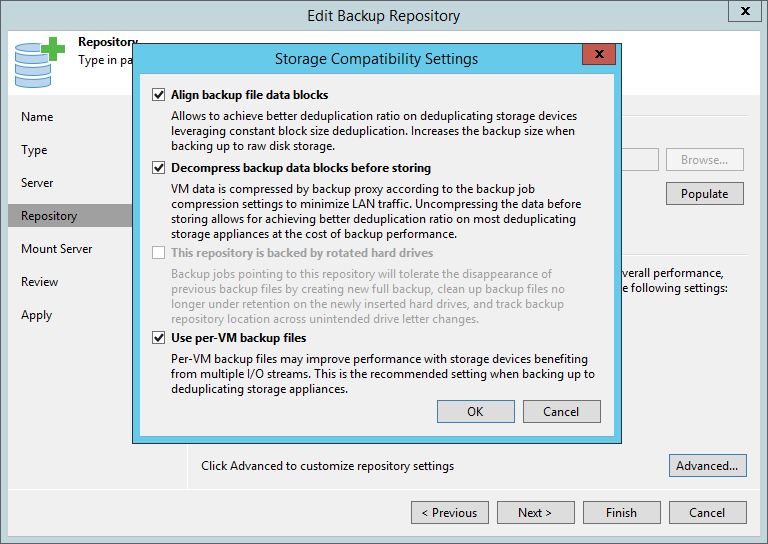 The Veeam backup proxy decompresses the backup data blocks before storing to the repository. This configuration allows for an uncompressed backup file to be sent to the target, meaning more efficient deduplication rates. 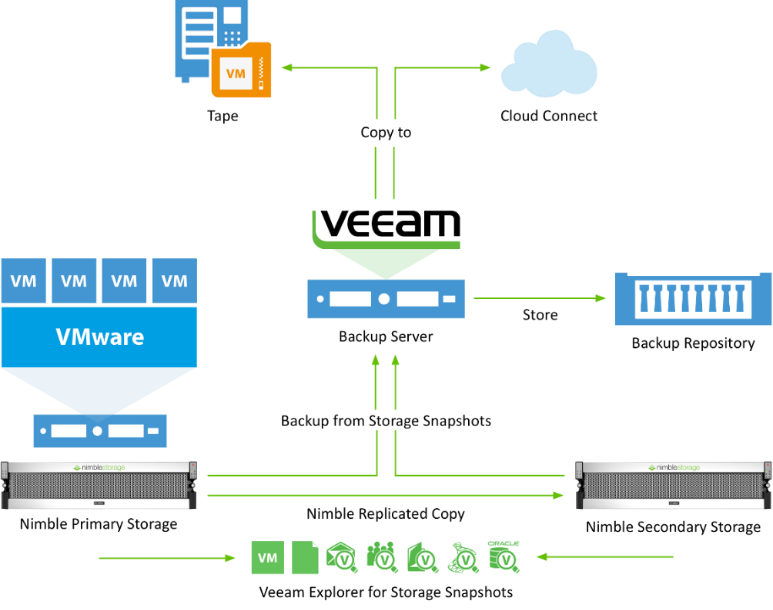 All of this, coupled with Veeam Backup & Replication 9.5 and the addition of Nimble storage integration, reduces the impact on the VM environment by offloading application consistent snapshots down to the storage array, then presenting that snapshot directly to a Veeam backup proxy (Backup from Storage Snapshots). Take advantage of snapshot orchestration to a secondary Nimble array by performing the backup from the secondary Nimble array, which reduces production impact on both the VMware environment and production array (Backup from Secondary Storage Snapshot). Finally, leverage Nimble performance for application-consistent snapshots and then clone them to create an automated, On-Demand Sandbox from Storage Snapshots for test and development cycles. In summary, backup from Nimble storage snapshots on primary or secondary arrays reduces the impact from data protection activities on production workloads. Add the new Nimble Secondary Flash array and this will benefit storage efficiencies as well as recovery performance. This is a great Availability option between Veeam and Nimble.